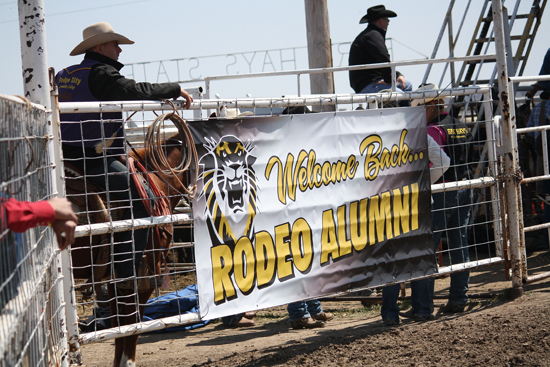 The 2011 Fort Hays State University rodeo hosted the club's alumni last weekend, and the group is looking at ways to help grow the rodeo program. One of the great things about attending the Fort Hays State University rodeo last weekend was seeing old friends. But there was a lot more to it. This was the first reunion in the 45-year history of the college’s rodeo club. The biggest and best thing about the weekend, though, came late Saturday afternoon when we talked about raising money for an endowed scholarship to honor longtime coach Garry Brower. The hope was to raise $10,000 over three years, and before the banquet began, we learned that $3,500 had been raised. Dr. Edward Hammond, who has been the university’s president for 25 years, showed us how to raise money. He opened his own checkbook and pledged to donate $5,000 if the alumni organization could raise just $1,500 in seven days. That generous offer, made by the only college president in the Central Plains Region to own bucking bulls, prompted fast action. In fact, Hammond was forced to write a check within 15 minutes of the announcement. That’s just the foundation, and I’d love to see the fund continue to grow. This is important to the Fort Hays State rodeo team; moreover, it’s important for the future of rodeo. If you’d like to contribute, contact Debra Prideaux, Executive Director, Alumni and Governmental Relations, Fort Hays State University, Robbins Center – One Tiger Place, Hays, KS 67601-3767.